A nearly indestructible ball that never needs a pump and never goes flat. Designed to outlast a standard soccer ball by years, this could be the last one you’ll ever need to buy. Every purchase supports a play project for an organization working with youth in a disadvantaged community, helping them get resources to enable play for youth living in areas where play is scarce or non-existent. Each play project is focused on a distinct need: equipment, infrastructure, and post-emergency relief assistance. Please note: You are buying a One World Futbol for yourself. Every purchase supports a play project for an organization working with youth in a disadvantaged community. Play projects help our partner organizations get resources to enable play for youth living in areas where play is scarce or non-existent. Each play project is focused on a distinct need: equipment, infrastructure, and post-emergency relief assistance. Dimensions (in packaging): 8" x 8" x 8"
Gave this to my college soccer playing son as he has gone through several balls. He really liked it and it does seem like it is indestructible! 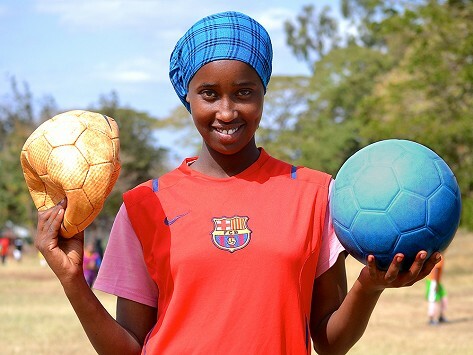 The One World Futbol just may be the last ball you ever have to buy.